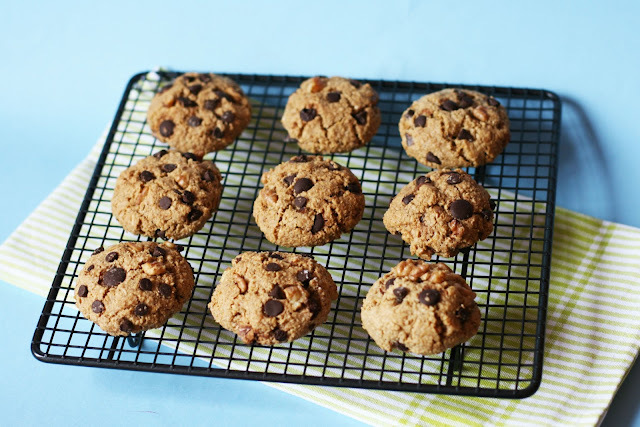 It's been quite a long time since I last published some cookie recipe. Why did I haven't baked cookies all these months?! Shame on me! 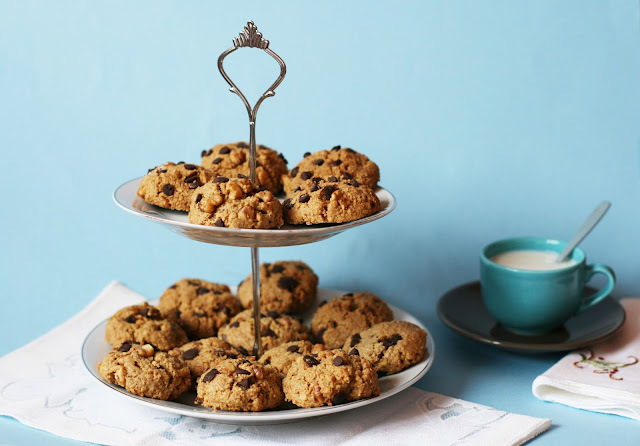 Nothing screams home more than the irresistible scent of fresh baked cookies and since I bought the awesome cookbook Vegan Cookies Invade Your Cookie Jar there was no excuse. Finally, cookies, an indecent quantity of vegan cookies were baked by yours truly this week to compensate all these months without them. As you can see I'm in a vegan baking frenzy, can't help it, sorry. Actually my vegan cookbooks are quickly taking over my bookshelves and to think that I can cook much healthier baked goods that are as yummy and tempting than the rest makes it even more interesting and challenging for me. These banana and walnuts cookies really surprised me! Really, really healthy cookies that make a great breakfast. It's an easy and quick recipe that doesn't require any super-special-rare-to-find vegan ingredient, perfect when you have some very ripe bananas and leftovers in your pantry. It's the first time I tried out the recipes from this cookbook so obviously (and being the stubborn-prefectionist I am) there will be some improvements and small changes in the future. For example: this recipe calls for 2 cups quick-cooking oatmeal and when I started making these cookies I found out I only had oatbran but I went on and, even though I'm sure the texture of the dough is better if you use oatmeal, they came out very good, chewy and not too sweet. I loved the banana-walnut flavor! 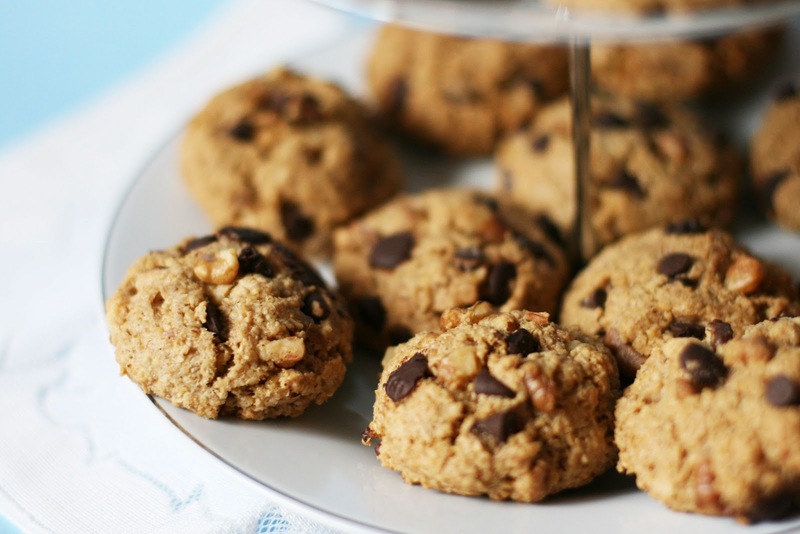 Recipe adapted from the book Vegan Cookies Invade Your Cookie Jar. 1 very ripe medium banana. 3/4 cup plus 2 tbsp all-purpose flour. 2 cups quick-cooking (not instant) oatmeal or rolled oats. In a mixing bowl, mash the banana well with a fork. Add the oil, sugar and vanilla and mix with a strong fork. Add the flour, baking soda, salt, and cinnamon and mix until the dry ingredients are just moistened. Add the oatmeal, walnuts, and chocolate chips and mix well. Use your hands for mixing when usign oatmeal, that way you make sure that the oats get nice and moist. If the dough is very slippery you might want to add a few tablespoons extra flour (it really depends on how big your banana was). Clean your hands and roll the dough into balls slightly smaller tan a golf ball. Flatten it a bit in your hands and place each ball about 2 inches apart on the cookie sheet. Bake for 12 minutes approximately, until lightly browned. 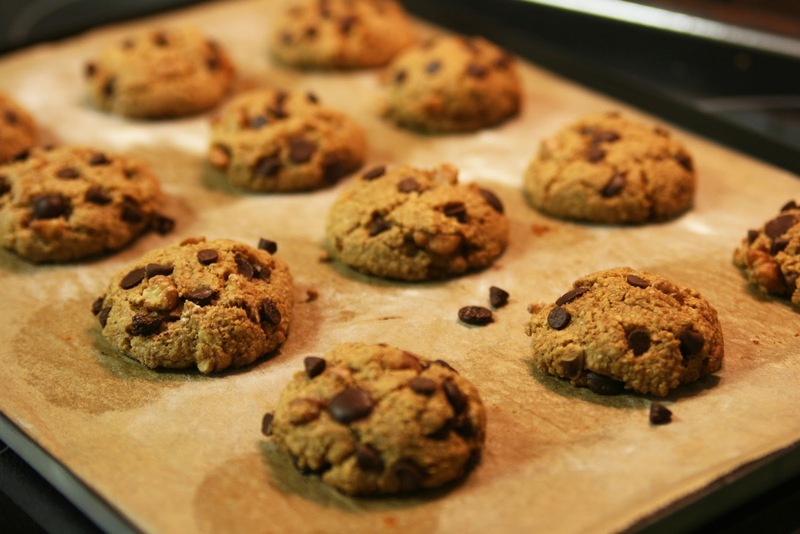 Let the cookies cool on the baking sheet for 2 minutes, then transfer them to a cooling rack. ¡Están muy ricas y son sanas! :-) ¡Cuando las pruebes ya me dirás si te han gustado Silvia! Aaaaaiiiixxx qué buena combinación!! Me pido unaaa :) y esas fotos...son una maravilla!! ¿Tienes blog? Me gustaría visitarlo! Otro beso grande para tí! Jeje, me halaga mucho tu comentario! ^_^. Un abrazo y muchas gracias por visitar mi blog. Si tienes uno déjame tu enlace y me pasaré! Hola Gemma, o sabía si dejarte el comentario en español o en inglés, así que como los demás están en español, te digo que me encanta tu blog y ésta receta, seguro que la hago, me encantó!! De verdad, tienes un blog precioso y haces unas fotos geniales, me quedo a seguirte para no perderme nada! Hola Esmeralda! Muchas gracias por visitar mu blog y por esas palabras tan bonitas! :-) Me hace tanta ilusión recibir visitas nuevas!!! El blog está en inglés aunque como verás las recetas también están disponibles en castellano. Hola Gemma al ver estas fotos, me está entrando una gran curiosidad por las recetas veganas. Las galletas me parecen nutritivas,apetitosas ,sanas y además me imagino su aroma...Se me hace la boca agua. 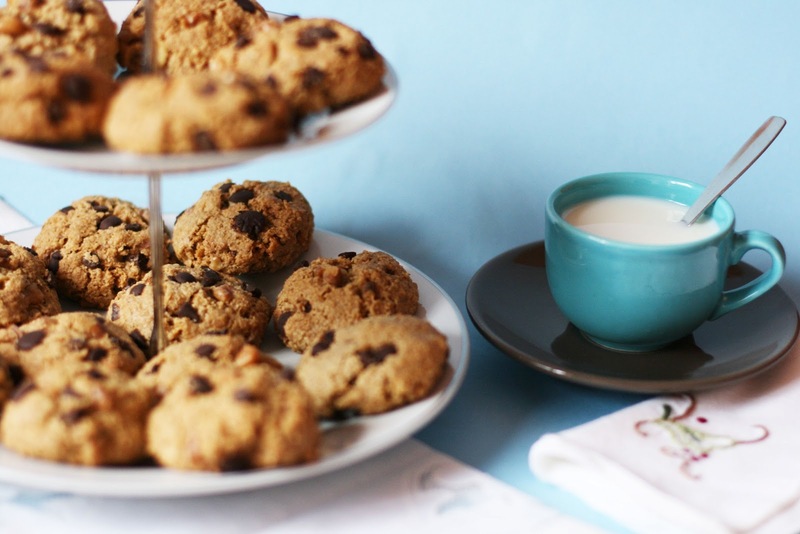 Una buena y sencilla manera de empezar con el mundo de la repostería vegana es haciendo unas cookies, suelen ser las recetas más fáciles para ir cogiéndole el punto a las recetas veganas. Son unas galletas que sorprenden, puede parecer que por ser sanas no vayan a estar ricas...pero a mí me encantaron, incluso son adictivas, jeje. Prueba a hacer esta receta este fin de semana y dime qué te parece.